Have you ever encountered data loss problems from your mobile phone? If so we have a solution to get back lost data from your cell phone device. But first thing you need to do is stop transferring data at once and don’t put any new file on the phone. Mobile phone data recovery software provides most convenient way to recover your lost or deleted photos, videos, images, audios, pictures and other precious data from your cell phone device. Cell phone data retrieval program is designed and developed with different search modes including Basic search, Deep search, photo search, video search, signature search for finding and recovering your lost files from cell phones. If you want to get back lost files from mobile phones, then follow the below instructions to restore data. Firstly download the mobile phone data recovery software. Install mobile phone data recover software. After installed the program on your pc, double click the icon to lunch the software. Connect the mobile phone with your computer using USB data cable. Select the drive from which you want to recover lost data. Select the partition form which you want to recover data. Choose files and folders to save. 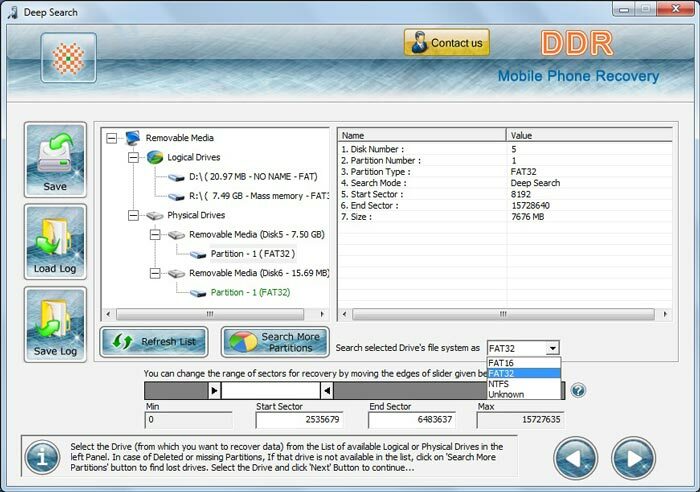 Mobile phone data recovery software supports data recovery of lost pictures (saved in JPG, TIF, PNG, BMP, GIF) Video (saved in 3GP, AVI, F4V, FLV, M2TS, M4V, MKV, MOV, MP4, MPG, MTS, WMV) Audio (saved in WMA, WAV, MP4, MID, M4A, AIFF) and other data saved in different files formats. Mobile phone data recovery software performs read only operations. It does not modify your data. Cell phone data restoration program uses inbuilt deep disk scanning mechanism to scan and retrieve lost data. Cell phone data restoration program provides attractive GUI and step by step wizard for computer beginners.